While I toiled away until the wee hours of the morning, Jen was busy assuming pickup, chef, and photography responsibilities. This meant she was lucky enough to pick up all the vegetables, lug them home, and make dinner! 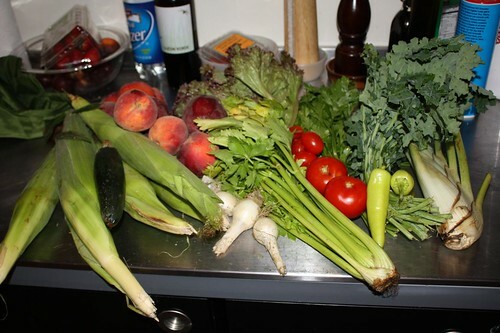 This week we got: tomatoes, celery, lettuce, onions, fennel, kale, parsley, corn, beans, assorted squashes, and peppers. Jen used all of this to make one of the most delicious pastas I've had in a long time -- and that was at 12:30 AM, cold, and out of the fridge. 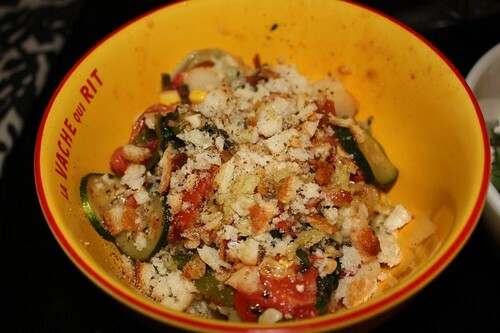 She used fettuccine, scallops, shrimp, zucchini, corn, heirloom tomato, and some type of green (kale?). It appears that the next few weeks may involve us moving, thus leaving the farm share and New York City behind for the greener pastures of right outside New York City. That will also involve the blog being updated at its current level of approximately once a week. However, we will be even closer to the vegetables that must enter New York City through one of our many bridges and tunnels. That means yet another exciting chapter of vegetal excitement to follow!